Hard landscaping adds architectural elements to the landscape. Pono Stone supplies the stone for paths and landscaped areas, walls, outdoor pools and paving. They can provide different options that integrate with the design of your outdoor area. 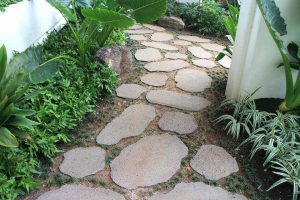 They can also source different colours, shapes and sizes that work with the hard landscaping area, or provide an interesting pattern for natural looking paths and paving. 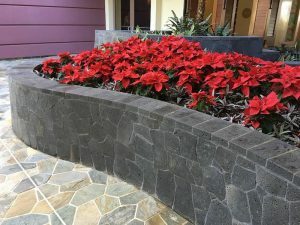 Using these featured products for hard landscaping not only adds impact to your projects, but brings new elements of colour and texture to the overall design of your outdoor area. Surrounded by 40 immaculately landscaped oceanfront acres, the Hyatt Regency Maui Resort and Spa is truly a vacation paradise where you can relax, indulge and be adventurous. 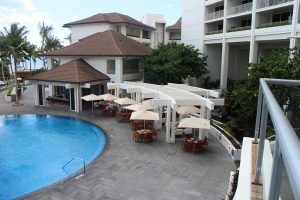 Pono Stone worked directly with the contractor and architect to supply the high quality natural stone in the large quantity required for this stunning resort. 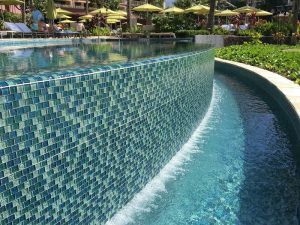 The stunning infinity pool has featured tiling by Oceanside Glasstile in an aqua and blue that shines through the water. The Oyster Classic Quartzite stone used for the garden paths, enhancing the landscape design. 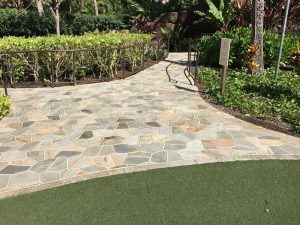 Natural Cut Puka Lava stone was used for the raised gardens, creating a lovely contrast with the Oyster Classic Quartzite stone used for the garden paths. The Four Seasons Oahu is an exclusive five-star beach resort balancing classic Hawaiian style with one-of-a-kind luxury. Pono Stone worked directly with the contractor and architect to supply the high quality natural stone in the large quantity required for this stunning resort. 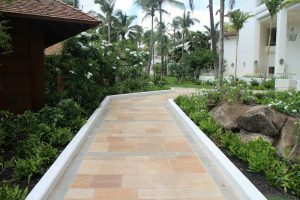 Natural cut Basalt stone was used for the garden pathways. Basalt stone was also used as a herringbone tile pattern for surrounding pool areas. The garden paths that enhance the landscaping design are Quartzite in Brazil Noble gold which consists of multiple colours - yellow, golds, beige, tan, almond, orange.